Brood parasitic. Present in Knysna all year. Calls ‘may-chee’. 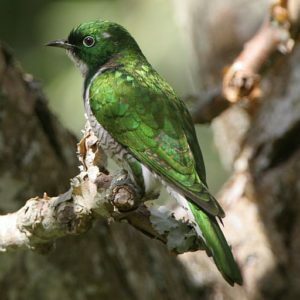 Hosts are small insectivorous birds, mainly warblers and sunbirds. insects, hairy caterpillars, butterflies, bug nymphs, beetles, fruit. 16 to 18 cm Resident insects, hairy caterpillars, butterflies, bug nymphs, beetles, fruit.